To successfully navigate workforce transformation, you need to consider both IT and end-user needs. Upgrading your hardware, and “right-sizing” it to fit your workforce only solves half the issue. 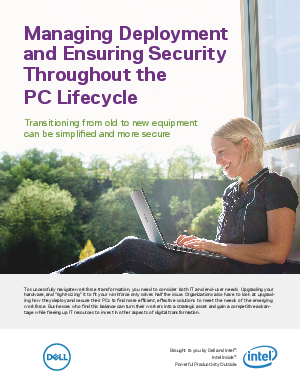 Download this executive summary to learn ways to best upgrade PCs efficiently with effective solutions to meet the needs of the emerging workforce. Organizations who find this balance can turn their workforce into a strategic asset and gain a competitive advantage while freeing up IT resources to invest in other aspects of digital transformation.